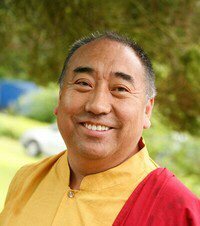 "Lama Karta is a recognized and acknowledged emblematic figure in Belgium. He has lived among us since 1987. Venerable Lama Karta is difficult to overlook, his presence has and impact on all those who speak with him. He gives courses in Buddhism in several European countries and he has written a number of books on Buddhism, including Introduction to Buddhism, which deserves to beread by all families, at least by the students who are particularly intrigued by the Buddha. One also encounters Lama Karta in churches,including Eglise des Minimes in Brussels, for concerts of mystic songs.His CD Buddhist Meditation Songs has been distributed worldwide." "May joy accompany you in everything you undertake to do."